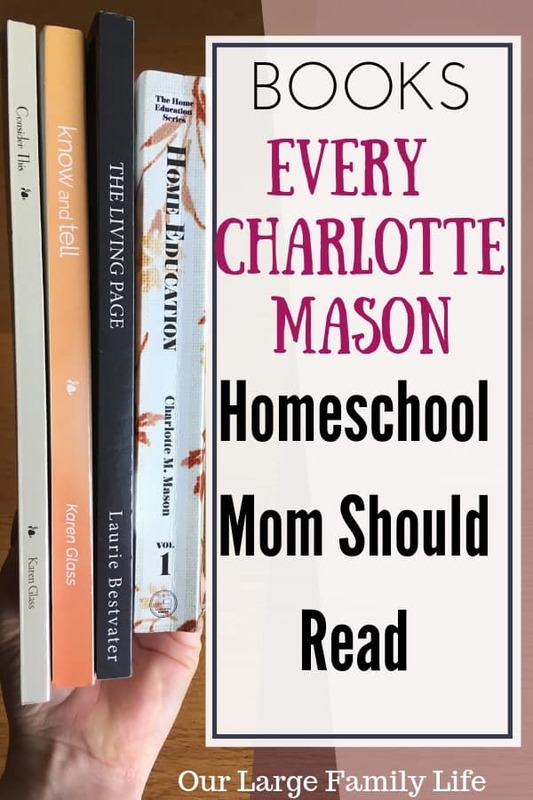 If you’ve been around the homeschool community for a while, chances are you’ve heard the name Charlotte Mason. Charlotte Mason was an educator in the 1900s who spent her life educating children and training teachers. She studied and wrote and founded the PNEU and influenced many people as a result of her life’s work. Charlotte Mason wrote 6 books about her philosophy of education. This is the basis of the CM movement. While her volumes are amazing, they are very meaty and can sometimes be hard to understand or difficult to determine how her principles can be followed through within our homeschools. As we’ve taken on more and more of Charlotte Mason’s philosophy there are some great books that have clarified her methods and how to use them in our homeschool. If you’ve been considering a Charlotte Mason education for your children, but are not sure how to practically achieve it in your home, these books are a great way to figure it out. Books About The Charlotte Mason Method. Of course, we have to start with Charlotte Mason’s volumes themselves. These will take you a while to get through. I’m not going to lie, they are amazing. Trying to read through them all before you start implementing could take a while unless your children are still babies and you have a couple of years before you start. I’m still working my way through the Home Education Series. She has a wealth of information not only on educating but on parenting in general. Even if you decide a Charlotte Mason education isn’t right for your family, you will still gain a lot of practical parenting wisdom by reading these books. This is the first book I read that really gave a picture for what the Charlotte Mason philosophy looks like when it’s lived out in daily life. It gives a picture of what life can look like with the principles are applied. Susan gives a picture of how to weave in truth, goodness, and beauty into your families’ daily interactions and the importance of doing so. This book gives a picture of what it looks like for your whole family to embrace CM. It shows how to create a family culture. This is a very practical book that helps you break down the different kinds of notebooks your kids will keep with a CM education. She addresses the notebooks that are mentioned throughout the home education series. She goes through the different ages and stages of the notebooks as well as how they were kept during the Charlotte Mason’s time. While there are still some notebooks that we don’t know a whole lot about, The Living Page gives lots of examples when it can. She also expounds on the importance of keeping notebooks and the worth of them as well. Since notebooks can be found so cheaply during school supply season, it is a really inexpensive part of the education that reaps big rewards. I really loved this book by Karen Glass. It dives into the Charlotte Mason philosophy as well as the classical education philosophy and how the two can work together. This book was especially good for me as I’ve always felt the two philosophies went together well. I’ve always loved the classical education philosophy and felt that the Charlotte Mason philosophy complements it so well. I found this book really informative as I lean towards meshing the two together in our school. It also gives great advice about why we are choosing this curriculum path over other philosophies. Also by Karen Glass, Know and Tell is all about the art of narration. The practice of narration is a cornerstone piece in the Charlotte Mason philosophy. This is the foundation of language arts, composition, and reading comprehension. Karen walks you through narration at the different stages. She also explains why narration is so important and how to trust the process. Learning a new philosophy of education can feel daunting, especially if you grew up in the public school system. Of course, if you really want to get the whole view picture of the Charlotte Mason method, the Home Education Series is the place to start. I love what these other authors have brought to the table in helping us learn how the different elements such as notebooks and narration fit into our school days. Finding other sources can often help us to determine Charlotte Mason’s meaning and how to practically fit these practices into our lives. As I continue educating myself on this method, I am thankful to have found it and am excited about the education my kids will receive. It is so important for us moms to be excited about how and what our kids are learning. Even if you don’t choose this method to educate your children you can still gain a lot of wisdom about parenting and family life in general. What books do you like to read to gain inspiration for your homeschool life?